Widely use in all interior or exterior marine, caravan, motorhome applications. Great for lighting under cabinets, cockpits, headliners and compartments. Our super bright 3" high polished stainless steel LED puck light with red lighting color is designed as your driving light at night. By emiting red lighting color, it can avoid glaring at light, which can eliminate the potential of driving dangerous. 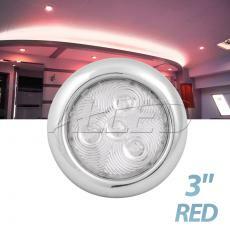 316 Stainless steel housing is a upgrade of your interior decor.